I unabashedly love New Year’s resolutions. Many people seem to have this sort of “resolutions, ugh, so bourgeois” attitude, but I enthusiastically embrace the new year as a time to start fresh, set goals, and make plans. 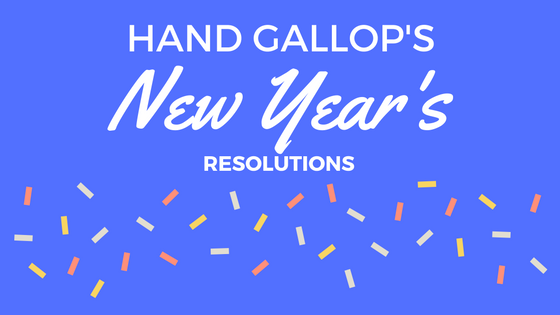 I think of resolutions as broad, big-picture things that can be achieved by making plans and setting realistic goals. Eat at home more often, which shouldn’t be too hard. Since moving, the amount of times per week I go out to eat has dropped dramatically. It’s much less tempting to go out when it’s a half-hour round trip. Plus, I love to cook! Utilize gym membership and positive peer pressure from friends to exercise more often. My neighbor and I go to the same gym, which gives me both a friend and someone to share a ride with! Meet Fitbit step goal of 10,000 steps per day. This shouldn’t be too difficult, as I get about 6,000 steps just feeding the horses twice a day! The equestrian Fitbit group is incredibly motivating (even when Austen soundly beats everyone week after week). If you have a Fitbit, you really ought find your fellow bloggers! After buying hay last year, I resolved to start saving immediately for 2017 hay. I get a commission bonus at every show I work; I’ve resolved to save every bonus I receive this year and put it toward hay. I don’t have much debt- just a couple of small, lingering student loans. This year, I’ll allocate a little extra money toward those loans so they’ll be paid off more quickly. Working at a tack shop is just as awful on my wallet as you think it would be. This year, I’m resolving to stop buying things that aren’t essentials. Horse treats, salt licks, and replacements for worn out or broken tack/apparel are essentials; saddle pads, breeches, and grooming products are not. I plan to continue volunteering with Green Country Dressage and the Oklahoma Dressage Society. I’d also like to begin volunteering with the newly reinstated Oklahoma Combined Training Association! Take one lesson per month. This was one of my goals last year, and it was a total failure. I want to make lessons a priority this year, because I know I’ll benefit from some specialized dressage instruction. Attend more educational events; I’ll include clinics in this, as I always learn a lot from auditing clinics! Ride at least 4 times per week. I don’t really have an excuse not to, as the horses and the arena are literally within walking distance of my house. I know this won’t be possible when I’m out of town for work, but that shouldn’t be more than five or six weeks this year. As show schedules are published, I’ll start putting together a calendar of events for 2017. I’m sure that will lead to some more specific, shorter term goals. Right now, I’m feeling motivated and excited to see what this year brings! Good luck with all your goals. Paying off my students loans has definitely made my life easier. Great goals!!! I really want a fitbit, maybe I’ll jump on the trend this year.